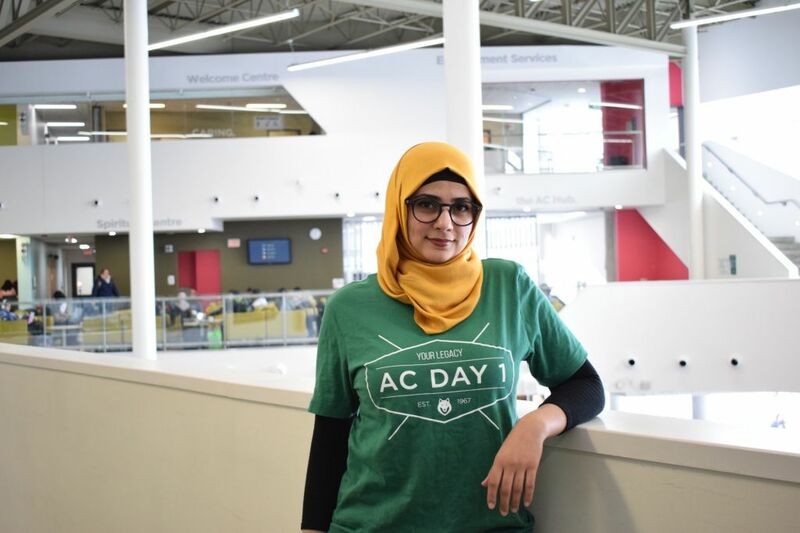 Algonquin’s AC Hub prepared an activity-orientated AC Day 1 on Jan. 7 for the many students starting in the winter semester – and for those returning from the fall semester. Many student volunteers and coordinators loaned a helping hand in aiding students around the campus and helping with the day’s activities such as Archery Tag and Arcade Games, among many others. One of the volunteers was Leanne Jarrett, a graduate of Algonquin’s event management program, who joined the AC Hub volunteer team three months ago. Although she had been a part of the volunteer team for a short time, she said that her experiences are immeasurable. “It’s just great helping new students and organizing events,” she said. One of the last events held in the ACCE Building was a friendly round of arcade basketball. At the other end of the campus, Sarah Al-Ahmadi wore a green t-shirt with “Welcome AC DAY 1” in white along with other students helping out as volunteers. Al-Ahmadi, 27, remembered being a first-year student and how she was lost at the college. She felt it would be helpful to use her knowledge as a former student at Algonquin for three years, to share it with new students. “‘Where is the cafeteria?’ is the question I got asked the most,” Al-Ahmadi said, “but I like working as a volunteer and I will do it next semester too. ”Other students, however, had some standing around to do on the first day back. Govind Sangh, a 24-year-old business student, had been in line for almost an hour to pay his fees. “I believe there were about 360 people before me,” said Sangh. Even though his number was 364, numbers 366 and 367 were called before him. Fees were not the only concern among students on the first day. Nelson and Nik, computer science and TV broadcasting students, were looking to change their programs. Both are returning students who finished their first semesters, but were looking for a change. College staff were working as hard as possible to leave no question unanswered. Zhi Yang started answering questions at 8 a.m. His lunch break was just half an hour and he had answered more than 30 questions so far. Among the most common questions were about wi-fi and Brightspace login information. International students were a part of the mix as well. Gurpreet Kaur is from India and arrived in Canada on Jan. 6 — one day before classes — to learn about the hospitality industry. She found the Canadian weather a little hard to adapt to. The January intake at Algonquin can be difficult for some as most students are already half done their studies for the year. Kaur is feeling the effects of this, especially because people are busy with their own friends. “I came early to finish with all the necessities but after that, I was bored because everyone was with friends and I was alone,” said Kaur. She went on to connect with three girls from her program who were all from India which, felt “so nice” for Kaur as it reminded her of home. She hopes to continue to grow and connect with more people in her program so that she doesn’t feel lonely during her time here. “I can’t wait to make new connections,” said Kaur, who just completed her high school education. While others were coming from different countries, others were back from their holidays. Rai, 18, of Ottawa, is a first-year cabinet making student. He, like many students, spent the holidays enjoying a much needed break at the end of the first semester. As he stood next to a large pile of rough-cut lumber, Rai spoke about how he spent his holidays. “I just spent my time playing games. I really like Mobile Legends, the game on the phone,” he said. Originally from Nepal, Rai noted that he was fortunate to have his family living in the city with him. “I have everyone here, all of my family. We just watched Netflix and movies the entire break. That’s all we did,” said Rai. He said that the three weeks off from class felt too short and that he wishes it would have been longer. AC Day 1 kicks off a new semester Reviewed by Baraa Jaafar on January 24, 2019 .